Bernadine “Bernie” Alice (Moyer) Clepper, age 86, of Mechanicsburg, passed away peacefully in her sleep at the Sarah A. Todd Memorial Home in Carlisle, where she resided for seven years, on Wednesday, September 12, 2018. Bernie was born on Friday, December 18, 1931 in Mechanicsburg to the late Raymond Milton Moyer and Gladys Violet (McNair) Moyer. Bernie was the widow of Paul Eugene Clepper, Sr., whom she married on November 5, 1950, and who died on September 27, 2014. In addition to her parents and husband, Bernie is preceded in death by her two sons: Robert Clepper and Jeffrey Clepper; her grandson, Joseph Clepper, and her three siblings: Betty Fahnestock, Lee Moyer, and Raymond Moyer. Bernie’s survivors include her four children: Paul Clepper, Jr. and his wife, Yvonne, of Carlisle, Gladys “Babs” Wilson of Mechanicsburg, Christine Musser and her husband, Daniel, of Mechanicsburg, Randy Clepper and his wife, Tracee, of Carlisle; her eight grandchildren: Angie, Barbara, Sandy, Tracey, Matthew, Sarah, Jesse, Tina; her 14 great-grandchildren: Katie, Brittney, Trevor, Anthony, Jayson, Emma, Travis, Dillon, Rhianna, Gabriel, Zachary, Joseph, Justin; and several nieces and nephews. Bernie attended Mechanicsburg Area High School as part of the class of 1951. She was a former member of Mechanicsburg Brethren in Christ Church, where she was very involved in a number of things. Bernie was a former member of Farm Women’s Group. She proudly worked as a dairy farmer’s wife in Monroe Township for over 35 years. Bernie enjoyed spending time outside in her garden and tending to her flowers and roses. She also liked to sew, crochet, travel in the motorhome with her husband following their retirement, and bake. Bernie was known for her homemade pies, especially the peach and cherry. 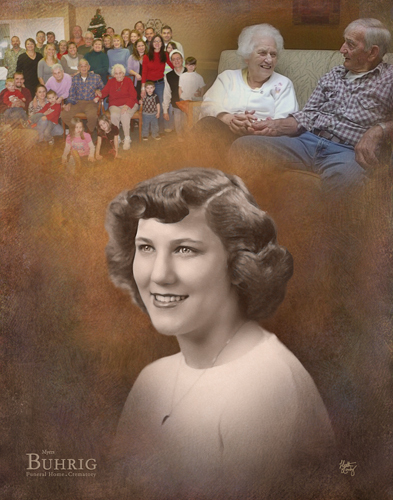 Family was the most important and cherished aspect of her life; she valued the time spent with her children, grandchildren, and great-grandchildren. All are welcome to join Bernie’s family at her gathering of family and friends on Tuesday, September 18, 2018 from 10:00 a.m. until time of service at 11:00 a.m. at Myers - Buhrig Funeral Home and Crematory, 37 East Main Street, Mechanicsburg, PA 17055; with Pastor Randy Zook officiating. Bernie’s family invites everyone to join them for a time of food and fellowship at Buhrig’s Gathering Place (next to Myers - Buhrig) immediately following the service. Interment in Longsdorf Cemetery in Mechanicsburg will be private and at the family’s convenience. Cremation was private. The family sends their most heartfelt thanks to everyone at the Sarah A. Todd Memorial Home in Carlisle for the loving care that was provided to Bernie during her illness. Contributions in celebration of Bernie’s life can be made to the Sarah A. Todd Memorial Home – Lindsey Dementia Unit, 1000 West South Street, Carlisle, PA 17013. Bernie’s family has entrusted her care to Myers – Buhrig Funeral Home and Crematory in Mechanicsburg, (717) 766-3421. Read Bernie’s full obituary, view her memorial video and portrait, and sign her official guest book at Buhrig.com.